The amount of notes and colors that you can add to chords on piano is always making guitar players jealous. 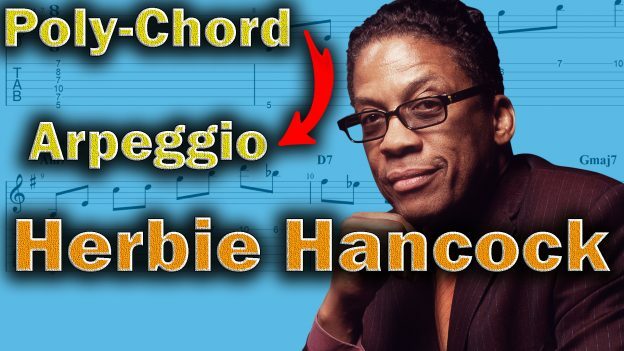 But in this Herbie Hancock Guitar Lesson I am going to take the Herbie Hancock Voicing for a m11 chord and show how you can transform it into a great arpeggio with a huge range and a lot of nice colors. In the process you also get a Herbie Hancock Guitar Chord that you can use for maj7 chords or m11 chords and taking this further to create some other arpeggios and chord voicings for other chords. This lesson is as much about applying material from piano than it is about this specific voicing. Learning and using material from other instruments is a very important part of Jazz. Jazz is a genre that is not dominated by one type of instrument, and different instruments have a leading role throughout Jazz history, just look at the shift from Alto to Tenor with Parker to Coltrane. The guitar is a little late to the game even if it has gradually become one of the most influential instruments in Jazz since the 1970’s. The Herbie Hancock voicing can be seen as a poly chord. If you play it on piano then the left hand is playing an Am triad (as a spread triad) and the right hand is playing a 2nd inversion G major triad. Which is an Am7(9,11) chord. The chord is shown in example 1 both as a complete 6 note chord and a more playable version that leaves out the root. The lower part is this Am spread triad or open-voiced triad. And the upper part, a G major triad. While it is difficult to really play this chord on the guitar it is very possible to turn it into an arpeggio and use it as an interesting melody with a large range. The easiest way to do that is probably to play it one note per string, as shown below in example 4. I have added an extra D on top because I like the sound of it. The first thing to try todo to create some more variations of the arpeggio is probably to understand it as a part of a scale. This allows us to move it around as a diatonic structure and hopefully find some other great sound and playable arpeggios. In doing so then it makes sense to start with the lower part. Here are the 3 string versions of the open-voiced triads. With this I think the low and the high G major are both a bit tricky, but it depends on how you sit and your guitar. The first thing to try is to move up the arpeggio a diatonic 3rd. This is shown in Example 7. I hope you can take this idea and use it in your own playing. Try to mess around with different arpeggio and chord ideas and let us know what you come up with either here or on the YouTube video! This entry was posted in Blog, Lesson and tagged guitar, herbie hancock, herbie hancock chord voicings, herbie hancock chords, herbie hancock guitar, herbie hancock guitar chords, herbie hancock guitar lesson, herbie hancock guitar tab, herbie hancock jazz lesson, herbie hancock lesson, herbie hancock music lesson, herbie hancock voicings, intervallic structure, jazz guitar, jazz guitar arpeggio lesson, jazz guitar arpeggios, jazz guitar arpeggios exercises, jazz guitar chords, Jens Larsen on October 4, 2018 by jens.